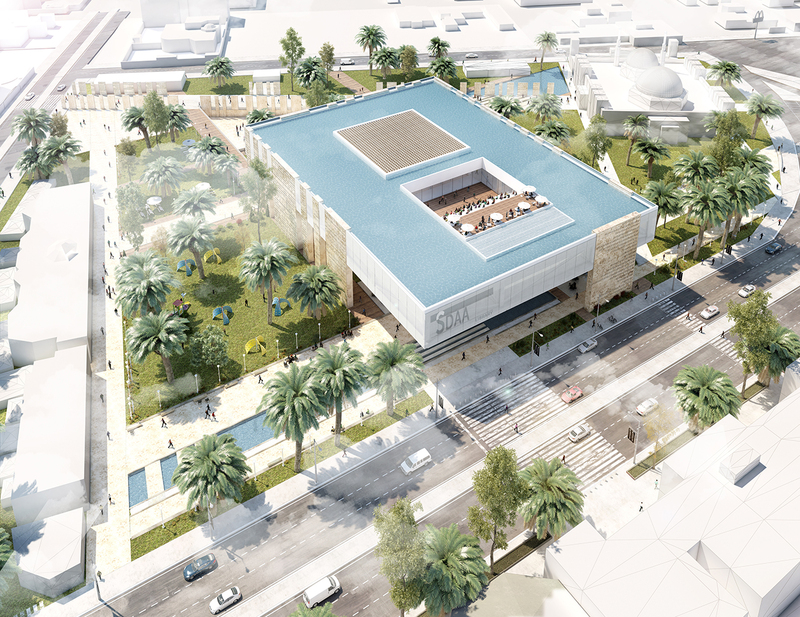 The project of the expansion of the exsisting Dar Al-Uloum Library moves from the arabian word “SDA_A” (the acronym of Sateh Dar Al-uloum_Adafh – the roof of the science house_expansion), that means literally “reflection”, that perfectly summerizes the main idea of the entire proposal. We deeply investigated its fundamental meaning, assuming different variations and declinations: the reflection of the light coming into the library, from the new triple height covered with stone lamellae, that give a sort of rhythm to the indoor functions; that of the water, able to reflect the sunrays, surrounding trees and built volumes, becoming a central element for the project; and in particular, the cultural reflection aimed by the reading leading to a deep and profund knowledge. 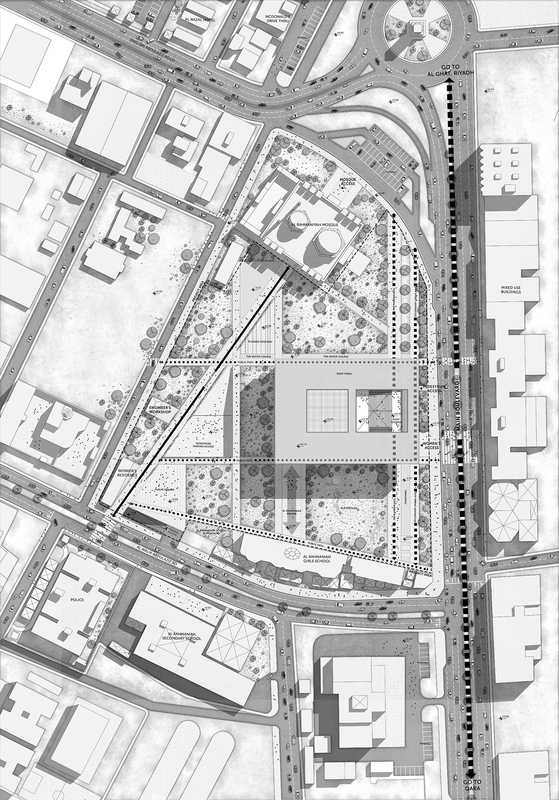 Starting from these considerations, and analyzing the surrounding urban context of the city of Sakaka, a question immediately appeared fundamental: the need to deeply understand what a Library is, and, more specifically, what a library of the XXI century should represent, nowdays and in the future? First of all, to design a library in the contemporary age, when information and communication are smart andaccessible to everyone, means to define a space where is possible not only to learn by reading but also to share experiences, enforcing the sense of community, the real nourishment of our society. After that, a second question immediately came out: how to intervene on an exsisting building, which image is now part of the city itself, upgrading its spaces and improving its sustainable performance? 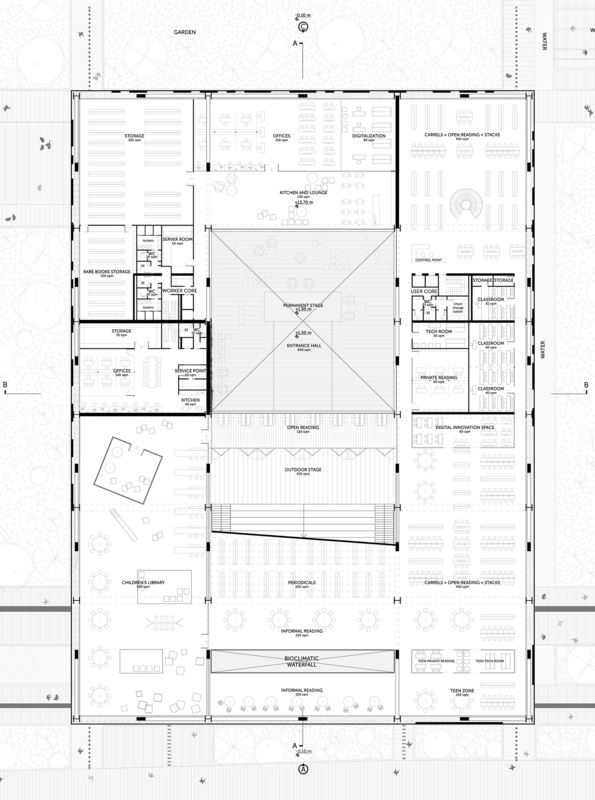 The main idea was that to keep the exterior “image” of the exsisting Library, preserving the facades, but radically changing the disposition of the main indoors, in order to re-think the space, conceiving it for welcoming women and men at the same time. The expansion of the library consists in a new living covering volume, placed above the exsisting one, acting as a propensity towords the future, hold up by structural written septa, and covered by water, that reminds to the natural elements and their importance, but that also act as a passive cooling system. The new volume will act as an “active” element, that will improve the sustainable performance of the whole system, and that will upgrade its internal functions. 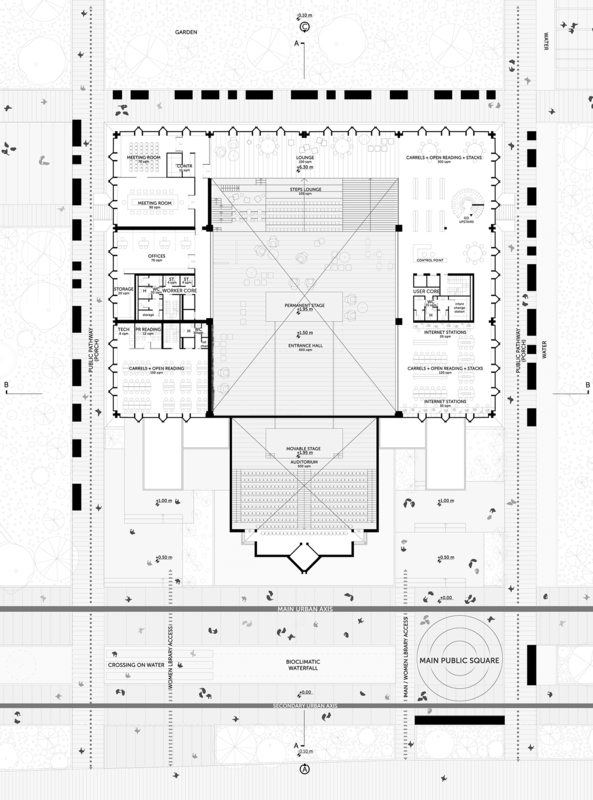 Going on, the upper floor, that consists into the new protunding volume, welcomes the offices and book storages, the last floor dedicated to the women, and the most of the mixed library, with also classrooms, teen space and childern’s library. The history of Saudi Arabia was also fundamental in our research: it is considered as the cradle of the civilization, for being one of the first fifteen areas of the planet in which human society was organized. It is clear its profund and ancient role of spreading knowledge since the ancient times, that need to be enhanced nowdays. We strongly believe that knowledge needs to be profoundly consciuos of the past and traditions, that become the “holding” elements of our future; as for written septa that hold the new protunding volume. Library embodies human culture and knowledge, and deeply needs to communicate to the surroundingurban fabric and the citizens: it is about a permanent communication, pointed to share the culture of the past , ensured by the huge stone septa with carved texts, and an interactive one, which purpose is to trasmit information about the future throught the bioclimatic waterfall that ensures a temporary and unique communication. 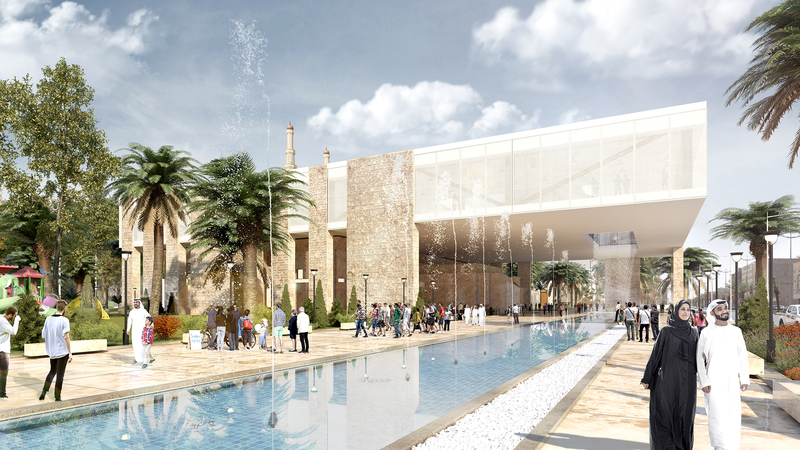 The outdoor areas are carefully designed, and conceived to attract people, and let visitors to spend time there. Pedestrian paths are hierarchically traced, ensuring a very easy accessibility to every area of the outdoor public park, and, in particular, connecting both exsisting and new functions. An underground parking area is provided, accessible from Al Malik Abdulaziz Rd. 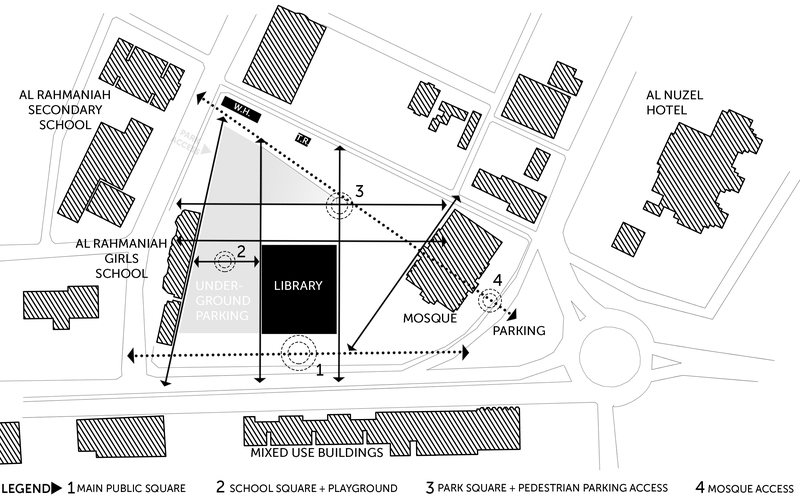 A main pedestrian path runs throught the project area, till the Mosque entrance, linking three main squares (one in front of the Mosque, one at the center of the park that allows the useres to reach the underground parking, and the last one in front of the Primary school). A very important goal to achieve, was that of an improvement of the sustainable performance both of the exsisting building that of the new one. The new volume is made of steel structure, with a double skin facade system, with a textile exterior cladding. 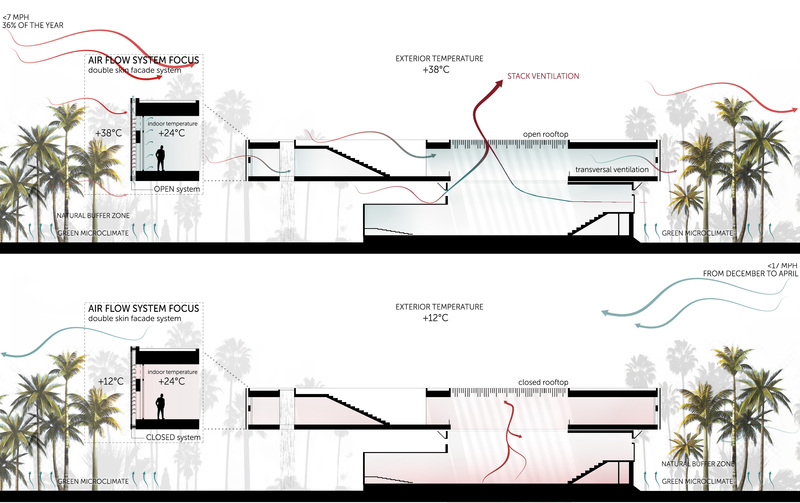 This solution, also with the roof pond cooling system, ensures on one side a comfortable indoor temperature, both in winter and summer time, and thanks to the textile cladding, a diffuse light coming into the indoor spaces of the library. In conclusion, SDA_A is not only a normal library, that offers to people a space where to read and study, but a new real meeting place, where to spend time together, in common areas and public features, deeply integrated to the city thanks to its public outdoor spaces, that turn into urban places. Collaborators: Luna Artoul, Roberta Menaguale, Anastasiia Orlova, Chiara Segatori.